What is it? In my words, IGF (internet governance forum), is group think and group participation to make the internet ecosystem and related better. Internet governance can be loosely defined as the rules and related, surrounding use and operation of the internet. The internet is special because of the bigness of its globalness and reach. The hashtag for this year's event was #TTIGF2019. Thanks to the organisers for this event and the convenience of the live stream. Recap from last year - My Takeaways from the TTIGF 2018 Forum. Below are my notes and takeaways from this years event. Much of it is my paraphrasing. We have to be careful that too many barriers can stunt the startup and digital economy. It was said that 68% of the Caribbean countries don't have data protection laws and many of the existing laws are outdated and then the question of enforcement (data protection agencies). Don't (overly) regulate before you (the region) get mature. I love this thinking. Over thinking should not overshadow, doing. Why is data sovereignty important? Then, data localisation can be expensive so data classification is important to this context. Useful here is hybrid cloud model. But localisation means keeping the high paying jobs and money here. Is it a cultural/Trinidad/Caribbean thing or just a society or region that is still developing? What about differences across generations. We need to understand users and culture in building more secure systems and processes. Training and education and understanding your users are important. A case for local system development. Also, adapt rather than adopt systems. Persons should become more risk conscious. Be sceptical. Inflexibility in design e.g. where is the option for delegation? We need to develop our local pool of developers and professionals. (Me talking now) The above by a MILLION, NO EXCUSES. If your organisation is sceptical at least start with small [low risk] projects. You would be amazed at how appreciative persons are for these small projects and how much this interaction can open your eyes to what we have locally. Technology is a double edged sword and what about trust in technology itself? We presume that most persons want to be more efficient and will embrace the movement towards change. Then there is the "this is how we have always done it" crowd. (Me talking now) We complicate things unnecessarily and we don't do a good job of clean up, remove, rework and streamline. A more manageable footprint works to our advantage. Why are we carrying around all this baggage? We have to work to not be innovation blockers. We have to have faith and trust in ourselves and our abilities. Does it make sense to have competing DPRs from differing regions? Would this become onerous? Should we be championing [umbrella] rules for all of the internet? Thoughts on having a (national or organisational) Digital Security Survey? Just like we do with the Digital Divide Survey. We talk about our cultural disposition as if it is only a bad thing in this context. What are some of the upsides? Edelman World Trust Index has on it's website, "But people are encountering roadblocks in their quest for facts, with 73 percent worried about fake news being used as a weapon." [QUESTION] Thoughts on countering fake news? [COMMENT] We should work to get Trinidad and Tobago ranked on this index. 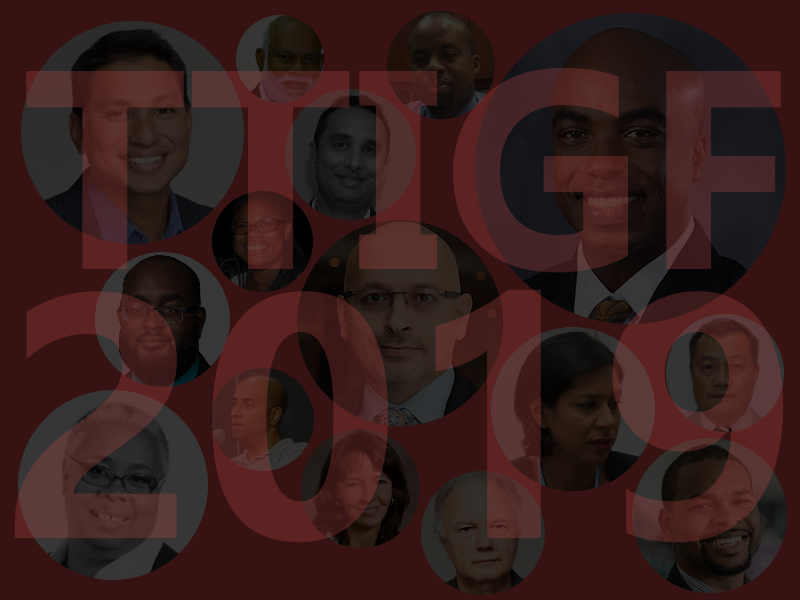 Open forum comment - Last year a comment was made for "an Internet Hall of Fame for Trinidad and Tobago". I want to throw that out there again. The topics are highly relevant; worth discussing. Of course, the trade-off for a short event is time to develop a longer agenda. We should look at models and cases. We have to be open to learn from others .... that is our problem. We have large egos that in the Caribbean .... that is a barrier. Paradigm shift in culture is required. I’d add we shouldn’t just think more about “privacy by design” or “security by design”, but “ethics by design” too. I fear it may take a great data scandal locally/regionally to catalyse local awareness/change. Very nice to see my Alma Mater, Naparima College represented at the TTIGF2019.